Now that we're well and truly into autumn, the golden colours of the beech trees in Three Cornered Copse are looking at their best. In a relatively mild season, with not too much wind, (unlike 30 years ago), the leaves hang on to their colours, and only slowly form a carpet on the woodland floor. There's a corridor of beeches with a narrow path between them that provides the best view of this spectacle. A walk through here on a bright morning is highly recommended, before the paths get too muddy. The age of the woods in Three Cornered Copse hasn't been established, but some of the larger trees must have been formed 100 or so years ago. Not as old as some of the ancient woodland around the south of Arundel, which is threatened by the new bypass, unless the right option is chosen. 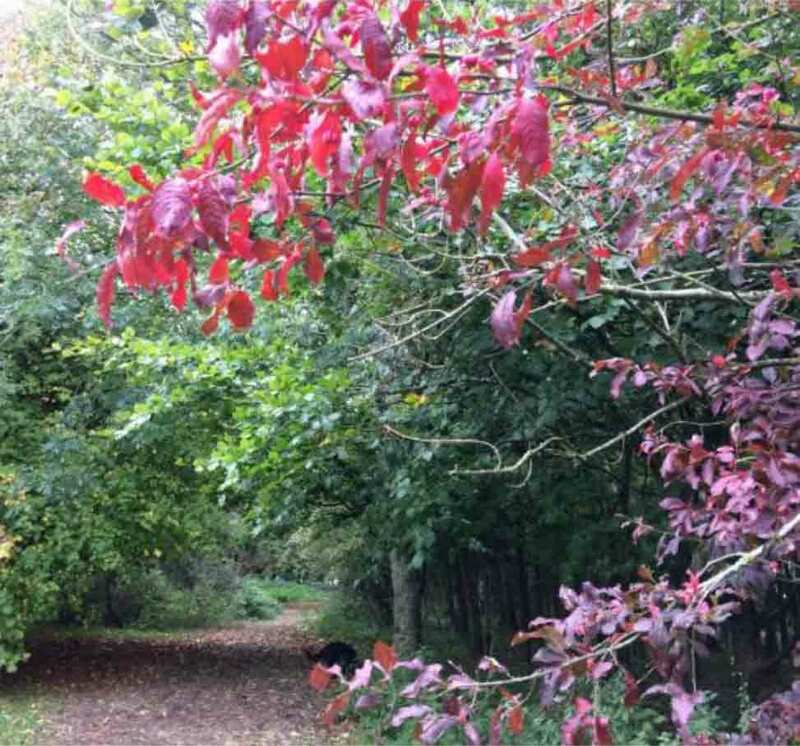 The Woodland Trust are campaigning to save this ancient forestry around Binsted, and are challenging planning decisions which lose this precious resource, to build a faster A27. It's a question of deciding whether this is worth losing, forever, the woodland and wildlife, so that folks can travel between Chichester and Worthing slightly more quickly. Cost, of course, is a huge consideration, but the road does need some help, to get around Arundel, and cut down the pollution generated by the traffic snaking along at rush hour. Have a look at the planning proposals on the Highways England website for more details. On our last workday we continued to tackle the brambles and nettles that have encroached onto the grassy slope, to reclaim the area for mowing next year. We also continued with the litter picking. We always find many plastic drinks bottles these days, which is a common problem it seems, as the Keep Britain Tidy organisation are campaigning for a deposit return system to reduce the wastage. Each day we buy 35 million plastic bottles in the UK, and clearly not all are recycled. If you'd like to help keep our not-so-ancient local woodland litter free, please come along to the next few work days. The dates have been fixed, and are on 11 November, 29 November and 9 December, weather permitting, as we always say in this season. We meet at the bottom of the green slope in front of the silver birches. All welcome.